Summary: Forced to accompany his father on one of his bone collecting assignments, Bing is fearful of the ghosts that may haunt them while his Ba is skeptical they exist. When the body they dig up doesn’t have a skull though and Ba’s health begins to deteriorate, Bing knows the bones are haunting them. Determined to help his father out since he is unable to work and to get away from collecting bones himself, Bing takes a job as a houseboy in a wealthy Vancouver household. Living in 1907 Bing faces the mounting prejudice against Asian people, but his cultural knowledge of ghosts and the spirit world help him appease the ghost haunting the place where he works. Bing learns to conquer his fear of the dead as he realises helping them rest simply requires some understanding and creative thinking. Review: Separated from his mother and grandmother in China and moved to Canada with his father, Bing is a fifteen year-old boy who is homesick. Added to that his father’s job of collecting the bones of the Chinese workers who died in Canada to send back to China so they can rest with their families and their ancestors. While it is honourable work, the fear of dealing with the dead causes bone collecting to be seen as a dirty job and looked down upon in Chinese society. While Ba, Bing’s father, doesn’t seem to mind the stigma attached to his work, Bing does because it affects him too. I grew to enjoy Bing as a character because while he starts out deathly afraid of ghosts he faces his fears out of necessity and grows to aid the dead in a different but equally important way. He uses the cultural beliefs of his community to help the family he works for soothe their ghost, and with the help of the local Fortuneteller figures out how to make his father better too by exposing the violent death of the bones they collected and reuniting the skull with the rest of the body. The Bone Collector’s Son by Paul Yee also explores the prejudices facing the Asian community in early 1900s Vancouver, British Columbia. I didn’t know about the riot that happened in 1907, but Yee’s writing always enlightens me about the Asian experience in Canada. It took me a while to get into Bing’s story, to accept the world of riled, sometimes vengeful spirits and ghosts who can make people sick with their haunting. Once I did though, I had to know if Bing was going to be successful in his endeavours. I was rooting for him, and I was not disappointed. 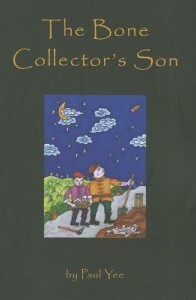 The Bone Collector’s Son by Paul Yee is published by Tradewind Books, (2003).